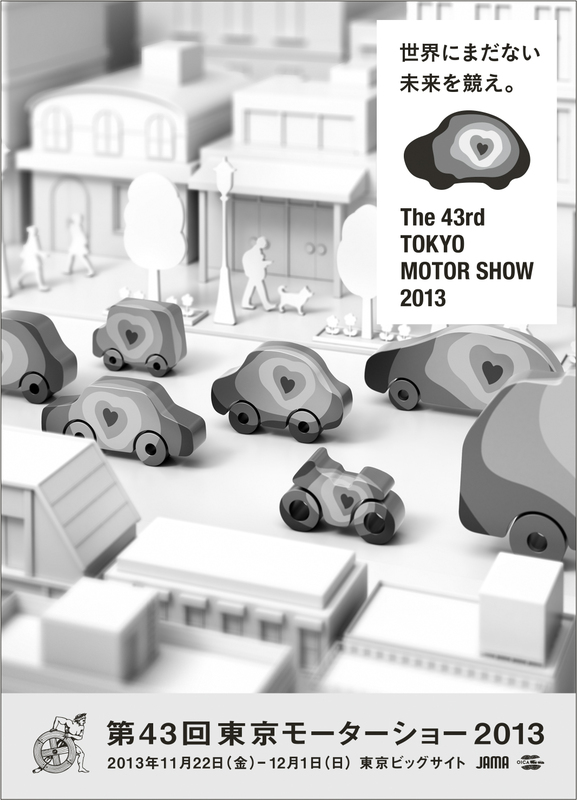 The Japan Automobile Manufacturers Association, Inc. (JAMA, Chairman: Akio Toyoda) unveiled the theme and poster design for the 43rd Tokyo Motor Show. The Show will be held at Tokyo Big Sight (Ariake, Koto-ku, Tokyo) for ten days from Friday, November 22 through Sunday, December 1, 2013 (Open to the public from Saturday, November 23). The 42nd Tokyo Motor Show in 2011 moved back to Tokyo for the first time in 24 years and considerably recovered visitor numbers to end on a successful note. The 43rd Show will continue its quest to become the top technology motor show in the world, while conveying the appeal of cars and motorcycles to an even wider audience. To express this spirit, the show theme has been set as below. "Compete! And shape a new future." Automobiles, motorcycles, and their technologies are the outcome of competition between people involved in product development, aspiring to of astonish and delight people around the world. The theme represents the desire to have visitors experience a future that doesn’t yet exist anywhere and is shaped by vying values, such as beauty, technology, and dreams. Like the emotions stirred by watching athletes enhance each other through serious battles, showing how various manufacturers seriously compete with each other at the Tokyo Motor Show will bring vigor and smiles to people in Japan and abroad. The poster design depicts competitive passion using heart motifs. Passions that thrive on cars, motorcycles, and their technologies are brought together in a friendly competition to shape the future. The poster represents a sense of anticipation toward this. Exhibitor applications for the 43rd Tokyo Motor Show 2013 will be accepted from Monday, October 15, 2012. The deadline is Friday, February 8, 2013.